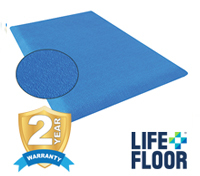 All have passed SlideRenu’s rigorous training standards. All must attend SlideRenu’s annual Operations Conference. All have resurfaced a minimum of 50 water slides over the past 5 years. All carry liability and worker’s compensation insurance that is in compliance with industry standards. All are certified to operate man-lifts/mini-cranes. All have passed OSHA training. 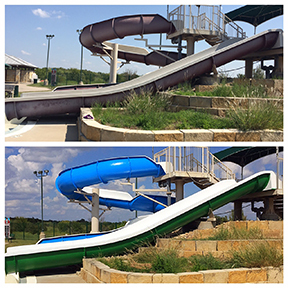 At SlideRenu® we understand and respect the investment you have in your water park's slides and aquatic features. Your water park's most vital assets shouldn't be entrusted to just anyone. While other contractors claim they can do the job, how do you know it will be done right? Investing in properly executed maintenance and refinishing services is just as important as your initial investment in your water slides. Selecting an inexperienced, untrained contractor is a risk that could cost your park additional money and unnecessary down time. SlideRenu® values your investment and the trust our customers have in us by utilizing the services of certified applicators and contractors to perform and complete maintenance, refurbishment and resurfacing services. 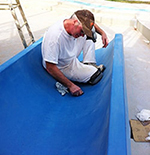 Contact us if you would like a no-obligation quotation to refinish or professionally wax your water slide.